Finnish public broadcaster YLE ran several stories about the Simon Wiesenthal Center (SWC) and the head of its Jerusalem office, Efraim Zuroff, on 16 March 2019. YLE reporter Katriina Töyrylä penned a long profile (in Finnish) of Mr Zuroff, in which she noted that "Zuroff is not alone in hunting Nazis; he receives help from contacts around the world — many of them with no remuneration." Ms Töyrylä referred to Mr Zuroff's contacts and work in Finland as well. However, she completely failed to mention that one of Mr Zuroff's closest cooperation partners in Finland has been Johan Bäckman, known for his support of right-wing extremists, Neo-Nazis, and Russian state terrorism. Mr Bäckman has been convicted of harrassing a journalist working at YLE, Ms Töyrylä's employer. The hate group led by Johan Bäckman published a Finnish translation of Mr Zuroff's book, "Operation Last Chance," using the name of our organisation without licence. The book is part of SWC's campaign to bring Nazi war criminals to justice, which Ms Töyrylä referenced in her article as well. In June 2012, Mr Zuroff visited Finland to take part in a presentation of the Finnish edition of his book, which is still on sale. 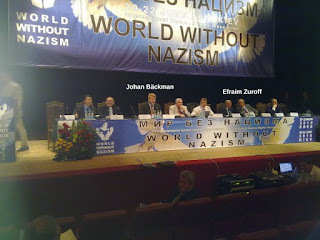 In February 2013, the Finnish Anti-Fascist Committee sent a letter to SWC regarding Mr Zuroff's continued cooperation with people who propagate Russian terrorism and antisemitism. Our letter was cited, among others, by Anton Shekhovtsov and Vyacheslav Likhachev, who have conducted extensive studies of extreme right-wing organisations in Europe. We received no response from either Mr Zuroff or SWC. In February 2015, Mr Zuroff joined the notorious fraudster, Andrei Zarenkov, in observing a torchlight march held by the right-wing populist Conservative People's Party of Estonia (EKRE) in Tallinn. In March of the same year, Mr Zuroff was in Riga where he joined a street performance organised by local pro-Russian propagandists, including Josefs Korens. In August 2015, Mr Zuroff told The Daily Beast's James Kirchick that he had left World Without Nazism (WWN), which is a now largely defunct Kremlin-sponsored propaganda organisation. WWN's leadership included at various times many people that Mr Zuroff has cooperated with, including Mr Bäckman, Mr Zarenkov, and Mr Korens. Mr Zuroff was one of WWN's founders. Newsweek reported in October 2014 that Mr Zuroff was "previously involved with WWN." None of this background information was cited in the several in-depth stories that YLE ran about Mr Zuroff, however. Antti-Pekka Mustonen, Chairman of the Finnish Anti-Fascist Committee, notes that Mr Zuroff's cooperation with anti-democratic provocateurs like Mr Bäckman is relevant information to Finnish readers, who are YLE's main target audience. We would expect that a story that recounts Mr Zuroff's life, from his childhood to his current personal relationship, would paint a more nuanced picture of his public activity. The only critical note in Ms Töyrylä's story was in relation to SWC's pro-Israel stance, not the activities of Mr Zuroff himself. In a world again beset by xenophobia and antisemitism, the work done by SWC is of vital importance. This in no way negates the need to take a critical look at the activities of the organisation's representatives. Doing so would have demonstrated the responsible journalism that YLE aspouses. In his interview with YLE (in Finnish), Mr Zuroff said that "denial of history is a form of moral pollution." At the same time, he continues to cooperate actively with people and organisations that deny the crimes of Soviet totalitarianism. This discrepancy is bound to colour the attitudes toward Mr Zuroff's activities in countries that have suffered as a result of Soviet and Russian imperialism.